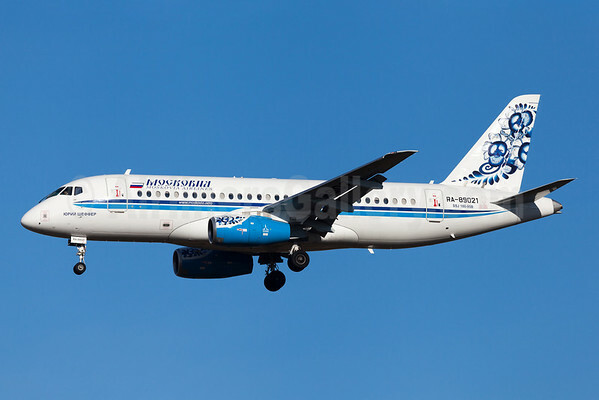 Moskovia Airlines (Moscow-Zhukovsky) filed for bankruptcy protection and reorganization in February 2014. Following an inspection of the airline’s operations this month by the Russian Federal Air Transport Agency (Rosaviatsia), the airline will longer be able to operate as a scheduled passenger airline according to ch-aviation. The airline will revert to a charter airline on September 1. Copyright Photo: Arnd Wolf/AirlinersGallery.com. The main aircraft for Moskovia now is the new pictured Sukhoi Superjet 100-95B and a remaining single Boeing 737-700 which is likely to be returned. RA-89021 (msn 95021) arrives in Munich. This entry was posted in Moskovia Airlines and tagged 95021, moscow zhukovsky, Moskovia, Moskovia Airlines, MUC, Munich, RA-89021, Russian Federal Air Transport Agency, Sukhoi, Sukhoi SuperJet, Sukhoi Superjet 100, Sukhoi Superjet 100-95B, SuperJet, Superjet 100, Superjet 100-95B on July 31, 2014 by Bruce Drum.